On Friday 13th September, Jon Moreno is collected from the psychiatric hospital in which he is a patient. His lifelong friends, Axel Frimann and Philip Reilly, want him to have some fun, they tell him, and believe a weekend away from the hospital is what he needs. Although very cold, around midnight they decide to go out on the lake (prophetically called Dead Water) in an old rowboat. An hour or so later, Axel and Reilly are back in the cabin deciding that the story they tell the police about Jon being missing will be essentially different from that which actually happened. 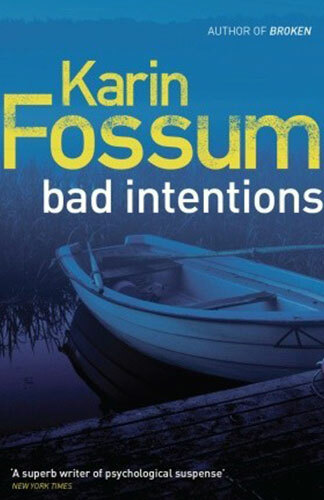 Fossum is a Norwegian writer and my first impression was that the translation was quite stilted. However, this style suits the story as we learn more about these three men and the episode which occurred during an earlier visit to a lake. The men are 25 – although my first impression was that they were younger – even, perhaps, teenagers. We don’t actually learn their age until much later. Axel is the leader: handsome, rich, charismatic; ruthless, cold and devious. Reilly who, for some reason never explained is always referred to by his surname, while the other two are Axel and Jon, is large, shambling, a drug addict with a rather surprising soft inner core. And Jon – well, Jon is in a psychiatric hospital. This is quite a short book, 184 pages, and very dark. The blurb refers to Fossum’s “Inspector Sejer series” but Sejer is a minor player. Rather, the story revolves round these three men, and the psychological reaction of each to an event which has changed their lives forever. I haven’t read Fossum previously and I’m still unsure as to whether I would read her again if this is indicative of all her work. It isn’t comfortable, it isn’t for readers of “cosies” although a form of justice is reached, but it is interesting and a book which will, I think, provoke vastly different reactions.